Life-support system for the temples of Angkor, Siem Reap (pronounced see-em ree-ep) is the epicentre of the new Cambodia, a pulsating place that’s one of the most popular destinations on the planet right now. (063-966601; www.angkornationalmuseum.com; 968 Charles de Gaulle Blvd; adult/child under 1.2m US$12/6; 8.30am-6pm,to 6.30pm 1 Oct-30 Apr) A valuable beginning to the glories of the Khmer empire, this state-of-the-art museum helps human define Angkor’s historic, religious and cultural significance. Displays include 1500 gorgeous stone carvings and artefacts. (www.artisansdangkor.com; 7.30am-5.30pm, silk farm 7am-5pm) Les Chantiers Écoles is a school majoring in teaching wood-and stone-carving techniques, traditional silk painting, lacquerware and more to impoverished youngsters. Free guided tours are available daily to learn more about traditional techniques. There is also a very great shop called Artisans d’Angkor. Les Chantiers Écoles also maintains a silk farm, where all stages of the production process can be seen. Free tours are available everyday; a free shuttle bus departs from Les Chantiers Écoles at 9.30am and 1.30pm. The farm is about 16km west of Siem Reap. (063-963836; www.cambodianculturalvillage.com; Airport Rd; adult/child under 1.1m US$9/free; 8am-7pm) It may be kitsch, it may be kooky, but it’s very common with Cambodians and provides a diversion for families with children. This place tries to represent all of Cambodia in a whirlwind tour of re-created houses and villages. There are dance shows and performances throughout the day, but it still doesn’tattract many foreign visitors. 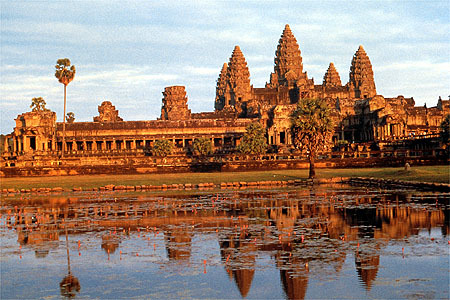 There is an unbelievable array of activities on offer in Siem Reap. (063-761139; www.angkor-golf.com; green fees US$115) This world-class course was designed by celebrated British golfer Nick Faldo. Fees rise to US$175 with clubs, caddies, carts and all. (Pithnou St; per person US$12) Daily cooking classes held from 8am to 5pm. (063-761593; www.bodia-spa.com; Pithnou St; 10am-midnight) Sophisticated spa near the Psar Chaa area offering a collection of scrubs, rubs and natural remedies, including its own line of herbal products. (092-787216; www.quad-adventure-cambodia.com; sunset ride US$30, full day US$170) All-terrain rides around Siem Reap take in rice fields at sunset, great temples and back roads through traditional villages where children wave and shout. Siem Reap offers everything from US$3 shacks with shared toilets to five-star luxury palaces. (012-800860; www.ivy-guesthouse.com; r US$6-15) An inviting guesthouse with a chill-out area and bar, the Ivy is a lively place to stay. The restaurant is as good as it gets among the guesthouses in town, with a wide vegetarian selection. (063-964774; www.shadowofangkor.com; 353 Pokambor Ave; r US$15-25) In a grand old French-era building overlooking the river, this friendly, 15-room place offers affordable air-con rooms in a superb setting. The newer annex across the river contains a swimming pool. (012 675881; www.downtownsiemreaphostel.hostel.com; Wat Damnak area; dm US$4-6, r US$13-17) Also known as Bamboo Garden, this hostel has enticing rates given there is a small pool in the garden. Outside visitors can use the pool with a US$6 spend on food and drink. (963380; www.sevencandlesguesthouse.com; 307 Wat Bo Rd; r US$10-20) A good-cause guesthouse: its profits help a local foundation that seeks to promote education to rural communities. Rooms include hot water, TV and fridge. (063-760582; www.hanumanalaya.com; r US$60-100) A blissful boutique retreat, HanumanAlaya is situated around a lush garden and pretty swimming pool. Rooms are designed with antiques and handicrafts but include modern touches such as cable TV, minibar and safe. (063-964768; www.thesoriamoria.com; Wat Bo Rd; r US$39-63; ) A hotel with a heart, promoting local causes to help the community, this boutique place has appealing rooms with smart bathroom fittings. Fusion restaurant downstairs, sky hot tub upstairs and a new pool. (063-965167; www.steungsiemreaphotel.com; near Psar Chaa; r from US$63) This hotel has high ceilings, louvre shutters and wrought-iron balconies, in keeping with the French-colonial air around Psar Chaa. Three-star rooms feature smart wooden trim. The location is hard to beat. (063-761259; 063-766655; www.golden-banana.com; B&B r US$22-31, boutique r US$55-136) Prepare for some confusion, as this is Siem Reap’s Banana Republic. There are now four Golden Bananas occupying this crossroad near Wat Damnak, containing the original B&B and a high-rise hotel, along with two boutique hotels under different ownership. All are gay-friendly. (063-963390; www.residencedangkor.com; Stung Siem Reap St; r from US$280) The 54 wood-appointed rooms, among the most tasteful and inviting in town, come with verandas and huge jacuzzi-sized tubs. The great swimming pool is perfect for laps. Check out the sumptuous Kong Kea Spa. (063-761998; www.shintamani.com; Oum Khun St; r US$83-230; ) Contemporary chic designed by renowned architect Bill Bensley, Shinta Mani Resort supplies an inviting central pool, while Shinta Mani Club supplies more luxurious rooms. Shinta Mani has won several international awards for responsible tourism practices. Andy’s Cambodia (www.blog.andybrouwer.co.uk) A great gateway to all things Cambodian, it includes regular Cambodian travel articles. ConCERT (www.concertcambodia.org) Siem Reap–based organisation ‘connecting communities, environment and responsible tourism’. Lonely Planet (www.lonelyplanet.com/cambodia) Information on travelling to and within Cambodia, the Thorn Tree Travel Forum and up-to-date travel news. Phnom Penh Post (www.phnompenhpost.com) The online version of Cambodia’s newspaper. Sam Vesna Center (www.samveasna.org) The best source of information on sustainable visits to Cambodia’s world-class bird sanctuaries. Worthy restaurants are sprinkled all around town but Siem Reap’s culinary heart is the Psar Chaa area, whose focal point, the Alley, is literally lined with mellow eateries offering great atmosphere. There are some nice restaurants that support worthy causes or help train Cambodia’s future hospitality staff with a subsidised ticket into the tourism industry. For self-caterers, markets have fruit and vegies. Angkor Market (Sivatha St) can supply international treats such as olives and cheeses. (www.marum-restaurant.org; Wat Polanka area; mains US$3.25-6.75; 11am-10pm Mon-Sat) Set in a delightful wooden house with a spacious garden, menu highlights include red-tree ant fritters and ginger basil meatballs. Part of the Tree Alliance group of training restaurants, this experience is a must. (078-342404; www.haven-cambodia.com; Sok San St; mains US$3-7; 11am-10pm) Dine here for the best of East meets West. The fish fillet with green mango is particularly delicious. Proceeds help young adult orphans make the step from institution to employment. (www.blossomcakes.org; St 6; cupcakes US$1.50; 10am-5pm Mon-Sat; ) Cupcakes are elevated to an art form here, with an incredible rotating 48 flavours. Creative coffees, teas and juices are also available. Profits assist Cambodian women in vocational training. (http://tbpumpkin.com; Pithnou St; mains US$2-6; 6am-10pm) Downstairs it could be any ancient cafe, albeit with a delightful selection ofcakes, breads and homemade ice cream. Upstairs is another world of white minimalism, with day beds to lounge on. It has light bites, great sandwiches, filling specials and divine shakes. (www.sugarpalmrestaurant.com; Taphul St; mains US$5-9; 11.30am-3pm & 5.30-10pm Mon-Sat) Set in a wonderful wooden house, this is the place to sample traditional flavours infused with herbs and spices. Owner Kethana showed celebrity chef Gordon Ramsay how to prepare amoc. (www.letigredepapier.com; Pub St; mains US$2-9; 24hr) One of the best all-rounders in Siem Reap, the popular Tigre serves up authentic Khmer food, great Italian dishes and a wide range of favourites from most other corners of the world. (www.angkorw.com; The Alley; mains US$5-9; 11am-11pm) Crocodile, snake, ostrich and kangaroo meat add an exotic twist to the traditional phnom pleung (hill of fire) grills. It has spawned a dozen or more copycats in the surrounding streets, many of which offer discount specials. (www.chamkar-vegetarian.com; The Alley; mains US$4-8; 11am-11pm, closed lunch Sun) The name translates as ‘farm’ and the menu here includes some nice Asian flavours, such as stuffed pumpkin or vegetable kebabs in black pepper sauce. (www.le-malraux-siem-reap.com; Sivatha St; mains US$5-15; 7am-midnight) A good site for gastronomes, this classy art-deco cafe-restaurant offers fine French food. Try the combination salmon tartar and carpaccio to start, followed by a quality cut from the selection of steaks. (www.cuisinewatdamnak.com; Sivatha Blvd; 5-course menu US$22, 6-course menu US$26; dinner) Set in a traditional wooden house, this is the highly regarded restaurant from Siem Reap celeb chef Johannes Rivieres. Seasonal set menus focus on market-fresh ingredients and change weekly. Entering Cambodia from Vietnam is a leap from a powerhouse economy into one of Southeast Asia’s poorest nations. Though chaotic, Ho Chi Minh City and Hanoi feel downright urban and orderly compared to less-developed Siem Reap. As any proud Cambodian might tell you, Vietnam wasn’t always economically superior. Cambodia’s Khmer empire once controlled much of mainland Southeast Asia, including the ports of Saigon. By the 1800s, however, Vietnam’s political dominance was established and Cambodia came under its influence. The French later occupied both countries but favoured Vietnamese workers and bureaucrats. In spite of driving out of the colonialists in 1954, the 20th century’s latter half brought more war – this time proxy conflicts fed by China, the US and the Soviet Union. During the American War – in a period when Cambodia was backed by the US – American planes heavily bombed its countryside to wipe out communist guerrillas. This didn’t work. A sect of hardline China-backed communists, the Khmer Rouge, overran the weak US-allied government in 1975 to found a Communist regime that went on to become one of the most notorious dictatorships of the 20th century. By 1975 both Vietnam and Cambodia had birthed communist independence movements. But despite their ideological kinship, the antique feud didn’t die, and in the late 1970s Cambodia’s Khmer Rouge under Pol Pot attempted to retake land lost to Vietnam centuries before, beginning with Phu Quoc Island and later mounting a series of short-lived invasions in Vietnam’s Dong Thap province. The Vietnamese responded by invading and occupying Cambodia for a decade and installing supplicant Cambodian leaders. Many of the same individuals remain in power in Cambodia today. Leaders in both countries now speak of brotherhood between the nations, but you may hear regular Cambodians on the street speaking of Vietnam as the bully next door, and Vietnamese colloquially speaking of Cambodia as a ‘little brother’. Despite this sibling rivalry, Cambodia and Vietnam share plenty of cultural common ground. Gesturing with feet, for example, is taboo. Elders are revered. Both cultures prefer to tiptoe around social confrontation, and angry outbursts are regarded as a lapse into insanity. However, differences in the home are more pronounced. Swayed by Confucianism, many Vietnamese worship long-dead ancestors. Cambodians usually honour only their immediate family. Vietnam’s ‘two-child’ laws have also kept families smaller than those who in Cambodia, where more children mean more hands to support the family. In the contrary, the go-getter vibe in HCMC and Hanoi, Siem Reap still oozes laid-back warmth, but Cambodia is slowly becoming more like its rival. Visitors expecting a crumbling backwater will be taken aback by Siem Reap’s deluxe new resorts and chic lounges. Although you’ll still hear roosters crowing, you might also find a KFC up the block. On the street, the ever-growing tourism wave is exposing all walks of Cambodian life to outsiders. Though Cambodians openly grumble about Vietnam, the kingdom is following in its footsteps: shaking off a tragic past, welcoming global trade and sprouting office towers from a sea of tin-roof shacks. Vietnam may think of Cambodia as a ‘little brother’, but it must concede its sibling is growing by the day. Siem Reap is now clearly on Southeast Asia’s nightlife map, with many of the most beautifulsitessituated in the vicinity of Psar Chaa, on or near Pub St.
(The Lane; 5pm-late) Miss Wong carries you back to the chic of 1920s Shanghai. The cocktails are a draw here, making it a nice place to while away an evening. Gay-friendly and extremely popular with the well-heeled expat crowd. (www.asana-cambodia.com; The Lane; 11am-late) Also known as the wooden house, this traditional Cambodian countryside dwelling, dropped into the backstreets of Siem Reap, makes for an atmospheric place to absorb. (Pithnou St; 10.30am-3am) This lively bar opposite Psar Chaa has long been common with resident expats and tourists in Siem Reap. Top tunes, table football, a pool table and devilish drinks keep them coming until the early hours. (4pm-late) One of the most alluring bars in town thanks to low lighting and discerning decor, this is the place to come for electronica and ambient sounds. It heaves on weekends or when guest DJs crank up the volume. Happy hour until 9pm. (mezzebarsiemreap.com; St 11; 6pm-late) One of the hippest bars in Siem Reap, Mezze is located above the madness that surrounds Pub St. Ascend the stairs to a contemporary lounge bar complete with original art and regular DJs. Classical dance shows take place all over town, but there are only a few worth considering. (063-963561; www.angkorvillage.com/theatre.php; admission US$25) The setting is a striking wooden pavilion finished in the style of a wat, but the set menu is less appealing. There are two shows per night and it’s packed to the rafters with tour groups. (Pub St) Free traditional dance show upstairs from 7.30pm, providing punters order some food and drink from the very reasonably priced menu. Cambodia’s answer to Cirque du Soleil, Phare (The Cambodian Circus; 015 499480; www.pharecambodiancircus.org; behind Angkor National Museum; adult/child US$15/8, premium seats US$35/18; 7.30pm daily) is so much more than a conventional show, with an impression on performance art. Cambodia’s leading event, theatre and performing arts organisation Phare Ponleu Selpak opened its big top for nightly shows in 2013 and several past stars have gone on to perform in international shows around the world. An inspiring night out for adults and children alike, Phare reinvests all proceeds into Phare Ponleu Selpak activities. Animal lovers will be nice to note there are no animals used in any performance. Siem Reap has a wonderful range of Cambodian-made handicrafts. Psar Chaa is well stocked with anything you may want to buy in Cambodia, and lots you don’t. There are bargains to be had if you haggle patiently and humorously. Angkor Night Market (www.angkornightmarket.com; 4pm-midnight) is full of silks, handicrafts and souvenirs. Up-and-coming Alley West is also a wonderful strip to browse. A number of shops support Cambodia’s disabled and disenfranchised. (www.artisansdangkor.com; 7.30am-6.30pm) One of the nicest places in Cambodia for good quality souvenirs and gifts, with everything from silk clothing to elegant reproductions of Angkorian-era statuary. (063-964744; www.rajanacrafts.org; Sivatha St; 9am-9pm Mon-Sat) This quirky small boutique offers original wooden and metalware objects, some hewn from the shells of decommissioned weapons. Rajana promotes fair trade. (012 285930; www.samatoa.com; Pithnou St; 8am-11pm) If you find yourself in need of a party frock, this designer dress shop offers original threads in silk, with the option of a tailored fit in 48 hours. Samatoa promotes fair trade. (063-964860; Pithnou St; 8.30am-9.30pm) Opposite Psar Chaa, this shop has a wide range of silk and carvings, as well as a wide range of traditional beauty products and spices, all sourced locally. (www.smateria.com; Alley West; 10am-10pm) Recycling rocks here, with funky bags made from construction nets, plastic bags, motorbike seat covers and more. Fair-trade enterprise employing Cambodians with disabilities. Pick up the free Siem Reap Angkor Visitors Guide (www.canbypublications.com) or the two handy booklets produced byPocket Guide Cambodia (www.cambodiapocketguide.com), or look them up on the internet. There are ATMs at the airport and in banks and minimarts all over central Siem Reap, especially along Sivatha Blvd. The biggestconcentration of internet shops is along Sivatha Blvd and around Psar Chaa. Royal Angkor International Hospital (063-761888; www.royalangkorhospital.com; Airport Rd) A new international facility; affiliated with the Bangkok Hospital, so very luxirious. Tourist Police ( 097-778 0013) At the main Angkor ticket checkpoint. For most nationalities, one-month tourist visas (US$20) are available on arrival at Siem Reap and Phnom Penh airports and all land border crossings. One passport-sized photo is required. One-month tourist e-visas (US$20 plus a US$5 processing fee), which take three business days to issue and are valid for entry to Cambodia at the airports and the Bavet–Moc Bai border crossing with Vietnam, are available at www.mfaic.gov.kh. Anyone planning a side trip to the temples of Angkor and then returning to Vietnam will need a multiple-entry Vietnam visa or will need to arrange another visa while in Cambodia. There are two main options for travelling between Vietnam and Cambodia. Air travel is more comfortable, with daily flight connections between Ho Chi Minh City (HCMC), Hanoi and Siem Reap. Road travel is a more daunting prospect as it takes an entire day to travel direct between HCMC and Siem Reap, including a change of bus in Phnom Penh. However, it is easy enough to break the journey in the lively Cambodian capital. Siem Reap International Airport (REP; 063 761 261; www.cambodia-airports.com) is 7km west of the centre. Vietnam Airlines gives regular daily connections between Siem Reap and HCMC (one way from US$135, five daily) or Hanoi (from US$195, four daily). Silk Air also offers two flights a week connecting Siem Reap and Danang (from US$245). In theory it is possible to connect the same day with a change of bus in Phnom Penh, but this is easier travelling from Ho Chi Minh City to Siem Reap as opposed to the other direction, as Phnom Penh to Siem Reap services operate later in the afternoon. Tickets between Siem Reap and Phnom Penh (six hours) cost US to US, depending on the level of service (air-con, leg room, a toilet, a host). There are also some night buses between Phnom Penh and Siem Reap, which could be useful for people in a hurry. In Siem Reap, all buses depart from the bus station, which is 3km east of town and about 1km south of NH6. Tickets are available at guesthouses, hotels, bus offices, travel agencies and ticket kiosks. Some bus companies send a minibus around to pick up passengers at their place of lodging. You should prepare for a rugby scrum of eager moto (motorbike taxi) drivers when you get off the bus in Siem Reap. From the airport, an official moto/taxi/van costs US$2/7/8; remork-motos (tuk-tuk; US$5) are available outside the terminal. A moto/remork from the bus station to the city centre should cost about $1/3. Short moto trips around the centre of town cost 2000r or 3000r (US$1 at night). A remork should be about double that, more with lots of people.